HMS Victory was ordered by parliament in December 1758, although at this stage she was unnamed, the ship was designed by Sir Thomas Slade. Her keel was laid down in the Royal Dockyard in Chatham on 23rd July 1759. The ship was named Victory on 30th October 1760 and was completed after six years work. She cost �,176 which is approximately �558,750 in today抯 money. HMS Victory was launched on 7th May 1763. She took approximately 6,000 trees to build her. She was a first rate ship of the line and at the time encompassed all the technical advances of the time. HMS Victory fought in the battle of Trafalgar where Nelson flew his famous signal "England Expects That Every Man Will Do His Duty". Horatio Nelson was born on 29th September 1758 in Burnham Thorpe, Norfolk. He was educated at Norwich School then at Preston Grammar School in North Walsham. He went to sea at the age of 12 and rose rapidly to become a Captain at only 21. On the 13th December 1758, just a few months after Nelson抯 birth the Victory was commissioned. Nelson had a run of decisive victories at the Nile (1798), Copenhagen (1801) and Trafalgar (1805) which made Nelson an international hero. The Victory was already a veteran of three wars and four major battles when Nelson fought in her at the Battle of Trafalgar. The Victory has now survived a demolition order, the ravages of teredo worm, death watch beetle and a German bomb in World War II and is now being preserved in Portsmouth抯 Historic Dockyard. In 1805 Nelson left the George Hotel in Old Portsmouth by the back entrance to avoid the crowds that had gathered to bid him farewell. He went out the back door along by the Garrison Church to join HMS Victory. The crowds soon realised he had left by the back door and flocked to the sea front to see him. The Battle Of Trafalgar, which HMS Victory is so well known for, took place on Monday 21st October 1805 12 miles off the south-east coast of Spain between the British fleet and the Franco-Spanish fleet. When the fighting was at its fiercest Lord Nelson was pacing the quarter deck with Captain Hardy when at 1:25pm Lord Nelson was fatally shot by a marksman from the French ship Le Redoutable. Nelson was then carried below to the orlop by Royal Marine Sergeant James Secker and seaman James Sharman. Three hours later Nelson died having received the news that the battle was won. Victory had a compliment of 850 men and marines and weighed 3,500 tons at the time of the Battle Of Trafalgar and her top speed was 11 knots. In 1922 restoration started of HMS Victory and by 1928 the initial restoration was complete. In World War II she received bomb damage and due to the weather another major restoration programme started in 1955. 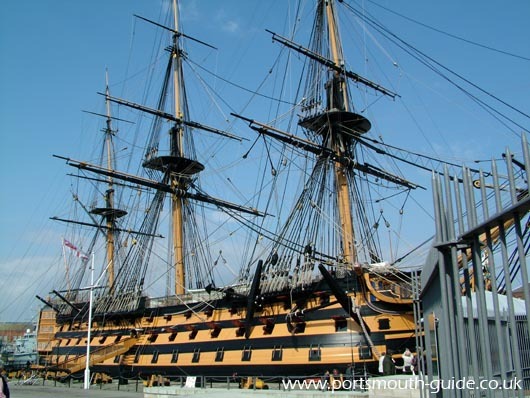 Restoration of the ship was completed in 2005 for the bicentenary of the Battle Of Trafalgar. During the bicentenary celebrations HMS Victory fired a full broad side which was witnessed by Queen Elizabeth II. Victory is now housed in a dry dock and is still a commissioned warship. She is the Second Sea Lord/ Commander-In-Chief Naval Home Command's flagship. She is therefore manned by serving naval officers and ratings. Victory's original top sail is on display in Storehouse No 10. The sail is a unique example of an early 19th century sail and besides the ship herself is the largest single artefact to survive from the Battle Of Trafalgar. HMS Victory is still a commissioned ship, which means it is the oldest ship in the Royal Navy. She flies the Commander-in-Chief Naval Home Commands flag to show she is still commissioned. A tour of the Victory takes approximately 45 minutes and takes you round all the decks, pointing out places of interest such as where Nelson fell and where Nelson died in the surgeons cabin. The above photograph is of the Victory Cutter Crew in one of the rowing boats from HMS victory.